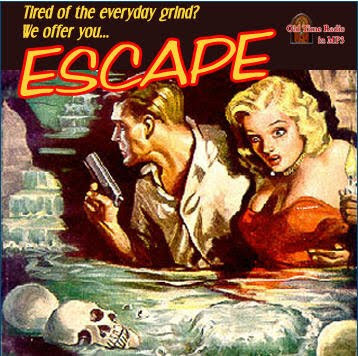 Of the more than 230 Escape episodes, most have survived in good condition. Many story premises, both originals and adaptations, involved a protagonist in dire life-or-death straits, and the series featured more science fiction and supernatural tales than Suspense. Some of the memorable adaptations include Carl Stephenson's "Leiningen vs. the Ants", Algernon Blackwood's "Confession", Ray Bradbury's oft-reprinted "Mars Is Heaven," George R. Stewart's Earth Abides, Richard Connell's "The Most Dangerous Game" and F. Scott Fitzgerald's "The Diamond as Big as the Ritz". John Collier's "Evening Primrose," about people who live inside a department store, was later adapted to TV as a Stephen Sondheim musical starring Anthony Perkins. Vincent Price, Harry Bartell and Jeff Corey were heard in the chilling "Three Skeleton Key" (broadcast on 17 March 1950), the tale of three men trapped in an isolated lighthouse by thousands of rats; the half-hour was adapted from an Esquire short story by the French writer George Toudouze and later remade for the 9 August 1953 broadcast starring William Conrad, Ben Wright and Jay Novello. Actors on the series included Elvia Allman, Eleanor Audley, Parley Baer, Michael Ann Barrett, Tony Barrett, Harry Bartell, Ted Bliss, Lillian Buyeff, Ken Christy, William Conrad, Ted deCorsia, John Dehner, Don Diamond, Paul Dubov, Sam Edwards, Virginia Gregg, Lou Merrill, Howard McNear, Jess Kirkpatrick, B.J. Thompson, Shep Menken, Frank Gerstle, George Neece, Jeanette Nolan, Dan O’Herlihy, Barney Phillips, Forrest Lewis, Robert Griffin, Alan Reed, Bill Johnstone, Sandra Gould, Junius Matthews, Carlton Young, Frank Gerstle, Marvin Miller, Frank Lovejoy, Berry Kroeger, Vic Perrin, Elliott Lewis, Eleanore Tanin, Herb Vigran, Jack Webb, Peggy Webber and Will Wright. Music was supplied by Dee Castillo, organist Ivan Ditmars, Cy Feuer, Wilbur Hatch and Leith Stevens. The announcers were Paul Frees and Roy Rowan. Great site, great bunch of OTR! - at least it seems to be announced as such, as the show seems to be called "Out Of This World" and the episode is "Dead Of Night - Audition". The second show is announced as "Escape" (The show name) and "Dead Of Night - Audition" (The episode name). Not a big deal, other than for historical interest. Thank you to all who work to make this site happen.